Gary's in Glasgow and usually when that happens I end up not wanting to cook proper meals just for myself, but today I felt in dire need of decent food. Gary also doesn't like spicy food, so I took this opportunity to cook myself some spicy food. 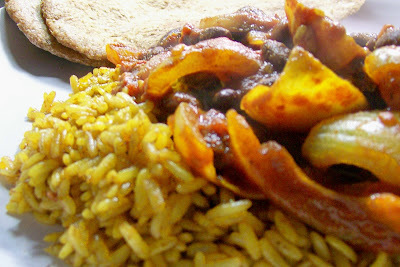 I made this kidney bean curry with seasoned rice to satisfy my craving. I also made some spiced flatbread thingies. There was no recipe for anything, I just used stuff i had lying around. Brilliant. The Aerogrow was all set up a week ago so I thought I'd post the progress. I may do this every Wednesday, or I may get bored. I make no promises. 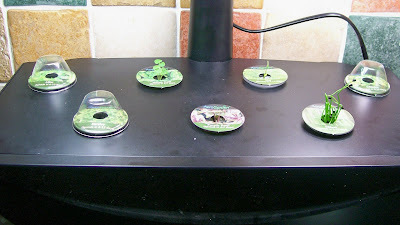 Anyhoo, the italian and purple basils, dill and chives are sprouting up nicely. The chives appeared in like an hour and seem to be growing bigger by the second. Not that I sit and watch it or anything, not at all... The mint has sprouted too but not enough to remove the lid thingy yet. The coriander and parsley aren't due to sprout until the 8-15 day mark, so it could be tomorrow, it could be next week. I know I'm on the edge of my seat! Vegan staples right there (not really, obviously). I made the Tangerine Baked Tofu from the Veganomicon for dinner tonight I pretty much followed the recipe except I used whisky instead of rum (coz I'm Scottish, duh), and I fried them with some cooking spray after the baking because they were all floppy. I'd been hearing a lot about these potato squasher things in Dreena's new book. I don't have the book, but I, like most people was annoyed not to have thought of it first. I also thought 'how hard can it be to squash a potato without a recipe? ', so here's my interpretation of the recipe. I parboiled the potatoes and then roasted them until they were nearly done. I took them out, squashed them a bit and brushed them with a spicy oil mixture (oil, cumin, paprika, cayenne, etc) and put them back in the oven. I think they turned out rather well. 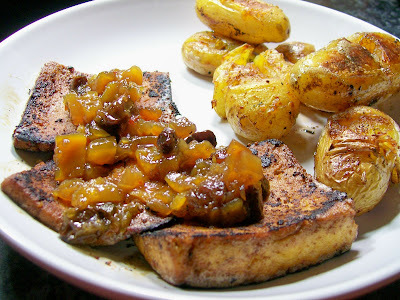 The stuff on top of the tofu is a carribean chutney I picked up in the shop ages ago and had been waiting for something to use it on. Oh, I promise to stop eating meals that consist of tofu and potatoes. Even I'm getting bored of it. 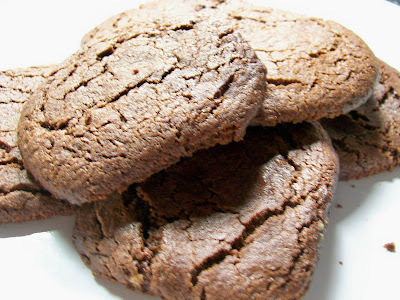 They're the Chewy Chocolate-Raspberry Cookies from Veganomicon. Isa totally lies when she says that they don't spread out. They totally do, and as a consequence I got a few oddly shaped ones from where they attacked each other/the side of the pan. Oh well, they were tasty so who cares. 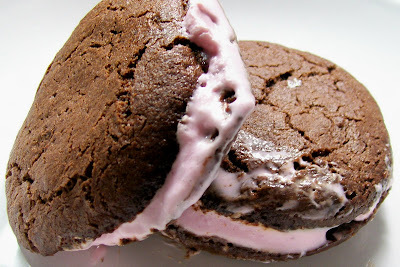 I also made some ice cream sandwich cookie thingies (it's an American thing, we don't do this here), with these and some raspberry ice cream. Like I said, I've never made ice cream cookie sandwich thingies so they're a bit messy, but again very tasty, so who cares. 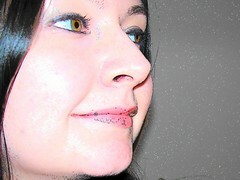 All of todays pictures were taken in front of my Aerogrow. It has a lovely level of UV light that's so much like natural light it takes a good picture. Yet another reason why I love my Aerogrow. Yum. 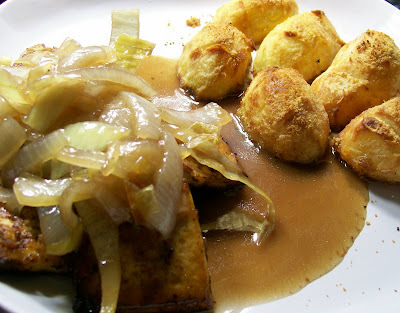 The tofu was marinated in a balsamic (and stuff) mixture for the best part of a day and then baked and fried. Has anyone else heard of Hasselback potatoes? I've made them before, but I went to google them to check I was spelling it right and there were no results! Weird! Anyhoo, you take potatoes and cut them in half lengthwise, par boil them, and then make a few scores into them. You then roast them and when they're very nearly done you take them out and put some breadcrumbs, and parmezano on them and roast them until crispy. The sweet onion sauce started out being the one from Veganomicon, but I got bored of that one and went my own way. It's just how I roll. Isn't she purdy? It came ridiculously quick, and I literally just set it up 5 minutes ago. I set it up myself which just shows how foolproof it is. I should apparently have my basil sprouting in 3 days, and everything else not long after. I've got purple basil, italian basil, coriander, chives, dill, mint, and parsley. How very exciting! Once the herbs are done (they'll apparently grow for 4-6 months) I think I'll be getting the salsa pack which has tomatoes and peppers. That is, unless they bring out something more exciting before then! I will of course be providing periodical updates on the progress of my herbs, because well, I'm sad like that. 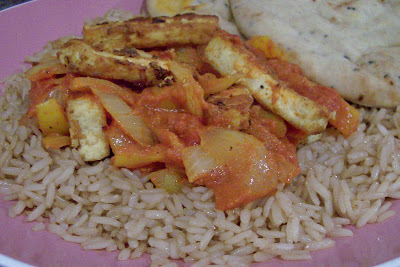 And now I give to you... A token Tofu Tikka Masala. From the Veganomicon. To be honest, I found this a little bit bland. Once I'd tasted a few bites I found myself reaching for the salt, and then the red pepper flakes, etc. I would definitely add more garlic next time (even though this time I already doubled the garlic), and I would also add some herbs to the dumplings. Nonetheless, it was filling, fairly healthy, and it looked pretty. Here it is served up. In other news, I recently ordered one of these for my incredibly poorly lit flat. 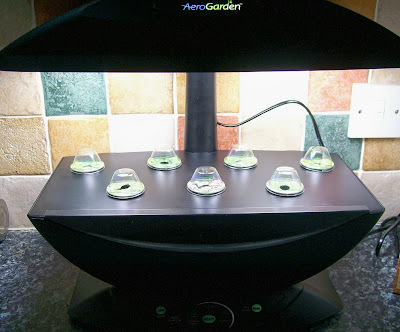 I'm very excited about growing my own fresh herbs, and then tomatoes... Mmmm... I am not your average 22 year old. What's Cullen Skink? What's a bridie? What's tofu?! Two of these three questions shall be answered. One shall not. Cullen Skink is a traditional Scottish soup. It usually contains smoked haddock and cream and all sorts of nastiness. I veganised it using smoked tofu and soy milk etc. A bridie is a type of pie. 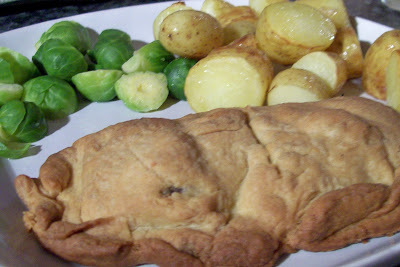 It's similar to a cornish pastie but has a shorter crust. 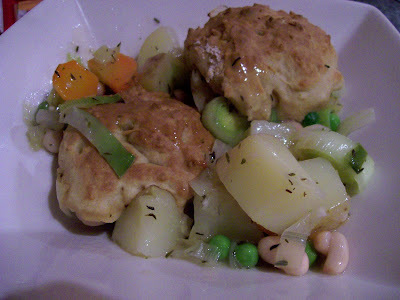 Hence, a Cullen Skink Bridie is a bridie filled with Cullen Skink! Huzzah! You come to Lelly's website and you learn something. I'm just good like that. I liked these, the filling was smoky and creamy like it should be. I meant to get a picture of the bridie cut open so you could see the filling, but clearly I forgot. I think I need to work on this recipe a little, yes, indeed, it needs a little bit if tweaking. Gary also liked it. I made four of these and I had the one in the picture. Gary came home from work and ate three before he'd even said hello to me. Not surprising really. Oh, if anyone can tell me the meaning of "Twa plenn bridies an ingan ane an aa" without looking at the wikipedia page, you will earn the title of 'person who Lelly thinks is cool'. It's an honour, believe me. 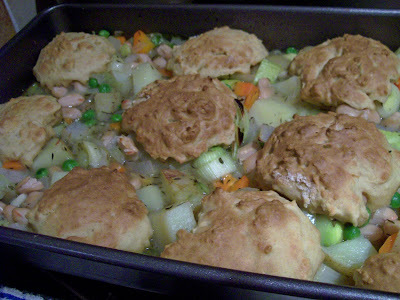 Yup, I got my Veganomicon last week and I have mainly been cooking from that. It's kinda weird having a Cookbook that's bigger than my Ecotoxicology textbook but there you go. The first thing I cooked was the spaghetti and beanballs. It was really quick and easy to make and the recipe yielded 40 gagillion beanballs (which was fine by us, we had the beanball sub for dinner the next night). It tasted quite healthy, but really, really filling too. The next thing I tried to make seemed doomed to failure. 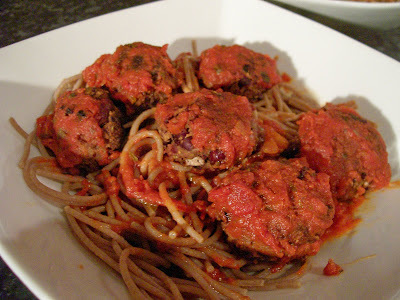 Quite simply, the vegan gods did not want me to make this dish, but I perservered. I was trying to make the Pasta with Spicy Tempeh and Broccoli Rabe. First of all, my trusty health store was mysteriously out of tempeh, and the shops were out of broccoli rabe. 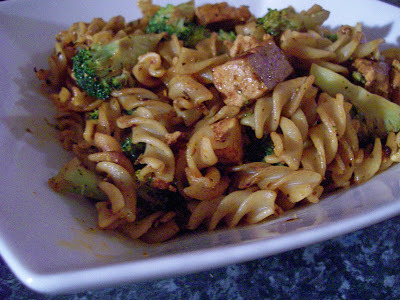 I ended up making Pasta with Spicy Tofu and Plain-Old-Boring-Regular-Broccoli. Because of subbing the Tofu, I had to adjust the method a little bit. I baked the tofu in the marinade for about 20 minutes before frying it. It didn't really matter anyway, because this turned out delicious. The tofu was strangely melt in your mouth, and the flavours worked perfectly. It really reminded us of a similar dish we got at a vegetarian restaurant in Prague (Clear Head). Yesterday morning I was awake at the crack of dawn (not unusual) and bored so I decided to cook me and Gary a big American style Brunch. 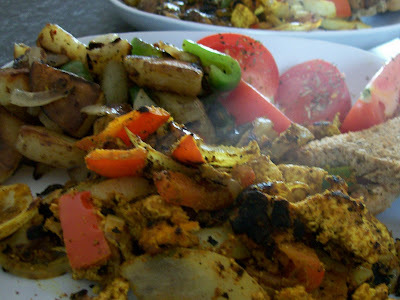 I made scrambled tofu, toast, sliced tomatoes, and the Diner Style Home Fries from the nominominomicon. I thought us Scottish folk had mastered the art of the fried potato for breakfast (tattie scones), but these were also pretty damn good. I'd definitely make them again. Even Gary hoovered his up and he's a crazy non-potato lover. Also, because I'm actually the nicest person in the world, I made Gary some garlic mushrooms for his brunch, even though I have the mushroom fear.